When I was a child, going to Denmark was the great trip abroad. This, as a daily ferry service operated from my hometown Arendal to the Danish port of Hirtshals. Thus, I visited Copenhagen, already as a kid, and have memories of great food way back. Having served the citizens of Copenhagen for 132 years, I am pleased to see that Restaurant Grøften, in the Tivoli Gardens still exists. In 1974 my mother, sister and I stayed in Copenhagen for a week, and one evening we went to eat in the Tivoli Gardens. Restaurant Grøften was the first place I ate Boeuf Stroganoff, and I am very happy to see that it still is on the menu. The Tivoli Gardens may for some of you be a tourist trap, but I will at one point return to enjoy a plate of Boeuf Stroganoff and think of times long gone. 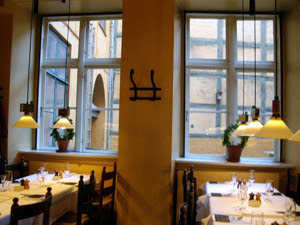 Restaurant Grøften is listed as a Frommers favourite in Copenhagen. As late as last year we visited Restaurant Ida Davidsen. She is a kind of a living myth in Denmark as she has brought the Danish smørbrød tradition to a level of perfection. In her restaurant close to Amalienborg Palace, she is said to offer the largest variety of Danish open sandwiches in Copenhagen (177 to be exact). As we were travelling on the ferry last year, we read an article on her passion for sandwiches in the Norwegian paper Aftenposten and decided to try to make a reservation, for the day after, and we made it. But! If you plan to visit Idas place - make your reservation well ahead, as it is immensely popular. We tasted a selection of her sandwiches, and were very happy indeed!! As a curiosa - on top of a salmon sandwich, she had a placed a small plastic cup of aquavit, meant to be poured over the fish. Great idea!!! Enjoy Food & Travel highly recommends this family restaurant that has served Danes their smørbrød since 1888. There are sadly no menus available on the internet.